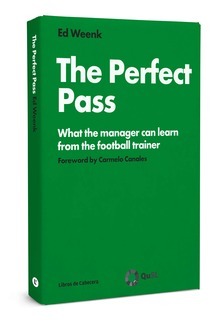 Nota del editor: Nos complace ofrecer un extracto del libro The Perfect Pass escrito por Ed Weenk y publicado por Libros de Cabecera. 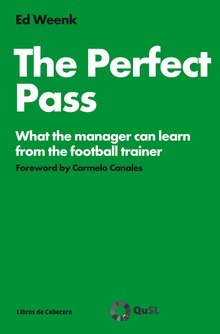 Before starting to work on the individual players' skills and the required standard routines, the trainer would normally spend a quite significant amount of time explaining where he wants to go, how he thinks the team can get there, how every player fits in and what he himself will do to make sure it will actually happen. All of this obviously based on the plan laid out during the pre-season preparation. He will be transmitting strategy and his action plan, he will explain the vision behind it and create a sense of team-spirit as well as belonging, feeling part of a bigger whole with a clear mission. In a football team, this transmission of strategy, vision as well as values is clearly a task of the trainer, although obviously his assistants, the technical director and even the president of the club should transmit the same message. In any case, the power of the message depends both on the messenger as well as on the way how it is delivered, in this I would like to stress the importance of the personal touch that the trainer brings to the table. How is this done in companies? Well, many companies might have gone through the motions of defining a vision, creating a mission statement and putting their values on paper, but unfortunately, in many cases that's where it stays, on paper. Whether stuck on a wall or bulletin board, published on the intranet or on page 2 of the annual report, it's still only paper. It seems that in (too) many occasions in practice these things are not taken very seriously, at least not by the ones that they should be aimed at: the employees. It strikes me when visiting companies, that in so few instances people actually seem to take pride in their mission statements or values. More frequently, they will say things like "ah, yeah, that's what we're supposed to be like", "well, it's more or less the same as any company" or similar comments. But if that's the case, then why bother investing such amounts of resources to define all of it? Or if in fact it's considered to be useful, why not make sure that these tools "come alive" somehow? In the end, vision, mission statement and values are tools which should serve a company to take it in the direction it wants to go, otherwise to me it seems a waste of time and money (and if we can't even convince our own staff of the messages, it is even less likely that we will convince customers with them). Maybe, just as the trainer in the football team does, the manager in the company should bring in some personal touch in order to bring the message closer to the work floor. To what extent do you think your strategy, value proposition and critical competencies are clear to all of your staff and to what extent do you think they understand that they themselves are also a vital part of getting there? To what extent do you have your strategy and value proposition published explicitly? To what extent do you think that your people are able to relate these strategic statements to the practical issues of their daily work? To what extent do you think that the strategy is "alive" to your people (do you feel that they are enthusiastic about it, do they share the vision)? What have you done recently to "spread the word" to your own people and how effective do you think that has been? To what extent do you think your people understand how their own activities fit in the big picture?